American food icon James Beard grew up in an Oregon boarding house operated by his mother. And New York Times food writer Craig Claiborne cut his teeth in his mother’s Mississippi boarding house kitchen. In a way, we’re still feeling the impact of those women’s pots and pans through the culinary legacies of their sons. Other citizens of these United States (and elsewhere) contributed to boarding house lore, too. Feeding travelers, businessmen, workers, and other groups, boarding houses played a huge role in the transformation of America from a rural, provincial nation to an industrial power. It’s no wonder that authors and artists, cartoonists and critics took on the archetypal boarding house and used it for creative fodder. Spare ribs were too much for me. There were, apparently, several versions of this little gem. Thomas Wolfe’s Look Homeward, Angel mimics life in his mother Julia’s boarding house, while Eudora Welty took the boarding house as a setting for her work, The Ponder Heart, with the memorable character of Edna Earle Ponder and her Beulah Hotel reigning among the pages. Of course, no discussion of boarding houses in literature could fail to mention Irishman James Joyce and his story, “The Boarding House,” in The Dubliners. And so what did people eat in these homes away from home? The defendant was released on her own recognizance, and the girl was advised by the police to change her boarding house or open bachelor quarters. Of course, Miss Ewing needed to move afterward, because Mrs. Cook would likely have served her something unpleasant, the least of which might have been a wad of spit in her tea! 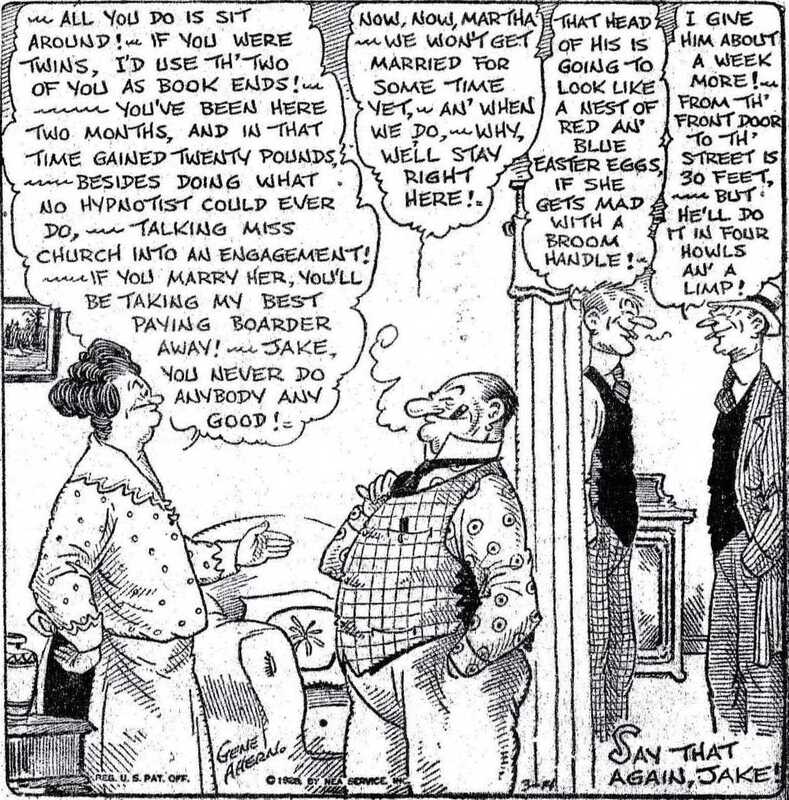 By the 1930s, boarding houses permeated the collective memory so strongly that cartoonist Gene Ahern created a comic strip called “Our Boarding House,” portraying the ups and downs of life lived among a group of strangers. Mrs. Wilkes’ Boardinghouse Cookbook: Recipes and Recollections from Her Savannah Table, by Sema Wilkes (2004) and Miss Mary Bobo’s Boarding House Cookbook: A Celebration of Traditional Southern Dishes that Made Miss Mary Bobo’s–An American Legend, by Pat Mitchamore and Lynne Tolley (1994). Wonderful! Thank you so much for sharing. Love the Skillet Lickers. Yes, I think that’s right, the 1950s. People became more affluent after WWII and private lodging/apartments seemed more affordable, not to mention the gradual increase in economic opportunities for women, etc. I remember reading that comic strip when I was a kid — and never understanding it at all. I think my father lived in various boarding houses in the 1920s and 1930s. He talked about the food a little, and I think my mother got a few recipes from the woman who rented out the rooms. Although he lived in the midwest, I always thought of it as more New York than midwestern. It definitely ended in the fifties as an institution with all the cultural baggage, I think. I stayed in a pension when I first started out in Peace Corps. But the one I stayed in wasn’t really where long-termers stayed. The American boarding house was a little bit different, I think. One of my great-aunts appeared in the 1930 census in a boarding house in Milwaukee, Wisconsin, one where mostly actors stayed, apparently. Nice entry. Boarding houses seem to be the American version of pensions in Europe and elsewhere. Cairo has some wonderful pensions, most run by Italians and Greeks. I loved staying in them.